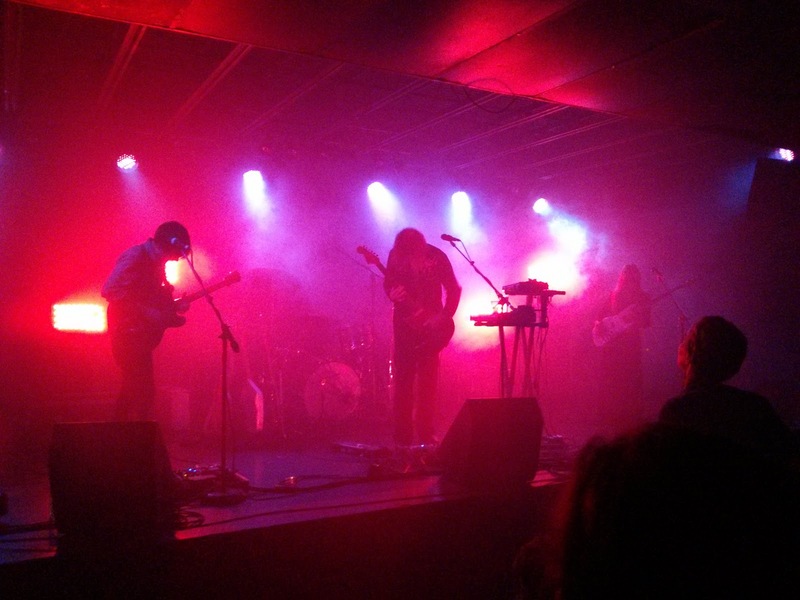 I missed all of Tone Rodents, but caught the last couple of songs by Suuns. I wouldn't have minded seeing more of them. The first several song were off the latest album, Until In Excess..., which I've only given a couple of listens thus far. I was disappointed to only hear one song off ...the Roaring Night, my favorite of their 3 albums I've listened to. They pulled out quite a few stops for a show at a small venue like Firebird. In fact, they probably overdid it with the fog machine (the whole place was filled up with it). But the pedal controlled lights were a decent addition. Too bad the show only drew maybe 50 people, which is disappointing considering that they have put out a couple of Polaris Music Prize nominated albums. I guess that's St. Louis on a Tuesday night, especially when you're an obscure indie band. The two guitarists used their whammy bars way more than I can recall seeing at a concert before. This makes sense when considering the music, but I never thought about it enough to realize that's what's going on. Overall, I think I set my expectations to high for this show, as I was a bit disappointed when I walked out. I think the setlist choices probably contributed the most to this. I could have done without the seeming two minute intros to almost every song. And they started pushing my patience with the jams, especially toward the end of the show. Their harmonies, in which all four members participated at one time or another, are just about as good live as on record.